Step 1: Spread out your seashells and separate them into piles by size (small, medium and large). Step 2: Wipe table with a damp cloth to remove any dust or dirt. 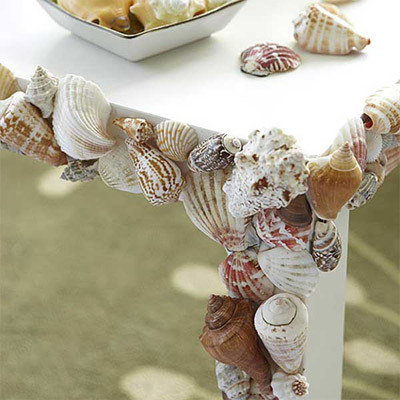 Step 3: Looking at table, develop an idea of where you want to put shells. You might try arranging them on the floor before you start gluing. Step 4: Use sandpaper to scuff up surfaces of table where you plan to attach shells.